One of the newer additions to Sunshine Plaza’s slew of hidden food gems is Steakville, a humble hole-in-a-wall that serves up some seriously good steak as well as a myriad of other enticing mains. Striving to bring the “farm to table” dining experience, Steakville sources their beef from specific farms, ensuring that only the best quality beef is chosen. Costing only S$15 for a hanger steak, we were beyond impressed given the quality of it. On top of their food, they also serve solid artisanal cuppas as well as an array of cocktails. Located within walking distance from NAFA and Kaplan, this new steak joint is definitely a great hangout spot for students as well given its location and affordable prices. With only 6 curated mains to choose from, Steakville keeps its menu offerings limited to ensure that quality is prioritised above all. This small, 25-seater restaurant is decorated with wooden furnishings and gentle lighting, making it a cosy space for an intimate meal. Starting our meal off proper with something to snack on, we opted for Steakville’s Italian’s Truffle Fries (S$12++) that features a bowl filled to the brim with truffle-infused shoestring fries, accompanied by a side of their house-made truffle mayonnaise dip. Salted just right and topped with a generous topping of shaved parmesan, it was pretty decent by our standards although we wouldn’t necessarily it was the best we’ve tried. 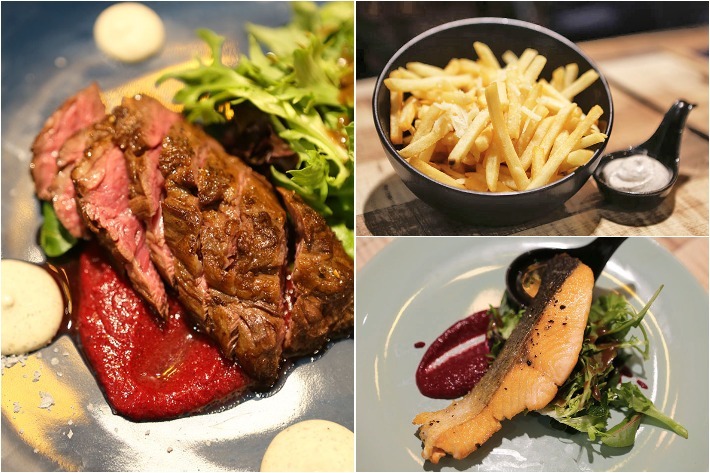 Coming to a place with a name like Steakville and trying anything but steak would be pretty silly, which was why it didn’t take long before we settled on their Signature Hanger Steak (S$15++) and it was hands down one of the better steaks we have tried. 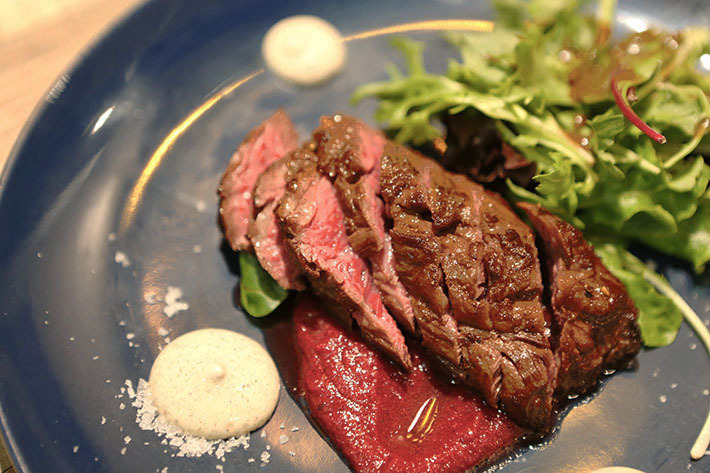 Served with a House Leaf Salad, beetroot purée, truffle mustard and Maldon sea salt and costing only S$15++, you get a decent portion of steak that is pan-seared to perfection. The steak was perfectly charred and incredibly juicy and tender on the inside. Even though the beef tastes excellent on its own, the combination of the subtly sweet beetroot purée and umami-packed truffle mustard really enhances the flavour of the meat tenfold. We also got the Seared Norwegian Salmon (S$15++) that comes with a generous piece of pan-seared salmon, salad, beetroot purée and herb-infused honey mustard dip. The seared salmon was cooked decently but our only gripe would be the fact that the skin was not as crispy as we had liked. However, the salmon was really soft and flaky just the way we like it. A tad salty at first, but soon balanced out when dipped into their special, sweet and tangy herb-infused honey mustard dip.